Levitation Is No Longer The Sole Domain Of Yogis Or Magicians! These electromagnetic suspended globes are actually high-tech instruments. A magnetic field sensor continually measures the height at which the globes are suspended. This sensor feeds that data into a micro computer in the base of the unit. This computer then calibrates the electronic magnets at the top of the frame based on the distance between the globes and the top magnet to keep the globes correctly positioned. All in the blink of an eye! So not only do these look great on your desktop levitating in thin air, they are also technology marvels! Your choice of either a 4" or 8" diameter globe. The 4" model (8 inches tall including frame) features an attractive brushed metal silver frame. 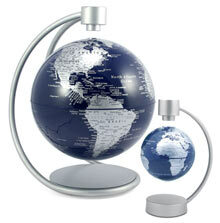 The 8" globe (14.5 inches tall including frame) comes with a chrome finished frame with a black and multi-colored globe. The level of detail on the 8" globe is greater than that of the 4". Each comes with a power supply (US, 120V only). The 8" model also features a red LED indicating power status built into the frame.